I've made two batches of the Rustic Bread from Jeffrey Hamelman's Bread: A Baker's Book of Techniques and Recipes and they have turned out excellent. 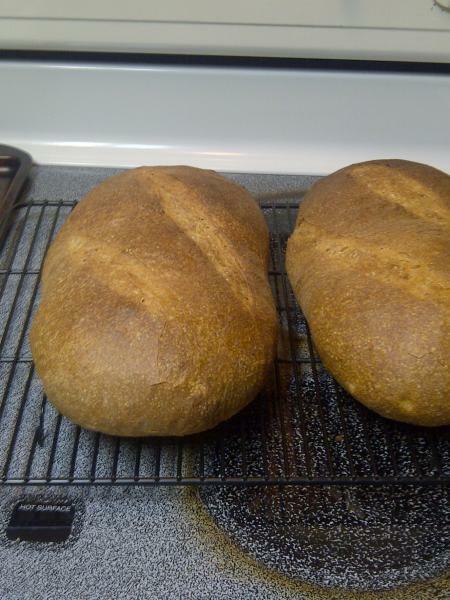 Pretty, too: for once my loaves are decently shaped. I'm not sure it is has so much to do with the recipe or just that, after 4 months of constant baking, I'm starting to get pretty good at this. I love the simplicity of this one: 2 lbs flour, 1 tablespoon salt, just over 1/2 teaspoon yeast, and enough water to hydrate it all. It still amazes me how the best bread is made with the fewest ingredients. I want to do a lesson on shaping soon, as well as one on pre-ferments. So I'm not going to cover those steps in the level of detail I should here, but I'll get enough of the recipe down that most people shouldn't have trouble following it. Put the yeast in the water and stir. Mix the flour and salt together in a bowl and pour in the yeasted water. Mix until the flour is hydrated, adding more water if necessary. Cover the bowl with plastic wrap and leave the pre-ferment out at room temperature overnight (up to 16 hours... if you need more time before baking put it in the refrigerator). To make the final dough, combine all of the ingredients except the pre-ferment in a mixing bowl. Chop the pre-ferment up into small pieces and mix or knead it into the final dough until they are thoroughly combined. This is quite difficult to do by hand: Hamelman assumes the baker has a mixer and can mix it for 5 minutes by machine. I mix and knead my dough by hand for about 10 minutes. At the end of that time the new and old dough aren't perfectly combined-- you can still see a few streaks of the lighter colored pre-ferment in it-- but they are sufficiently combined that loaves bake evenly. Place the dough back in a greased bowl and ferment for 2 1/2 hours, punching down or folding the dough twice during that time. At the end of the fermentation, divide the dough into two pieces and preshape each into a ball. Cover with a clean towel and let each rest for 5 to 10 minutes before shaping into the final shape. 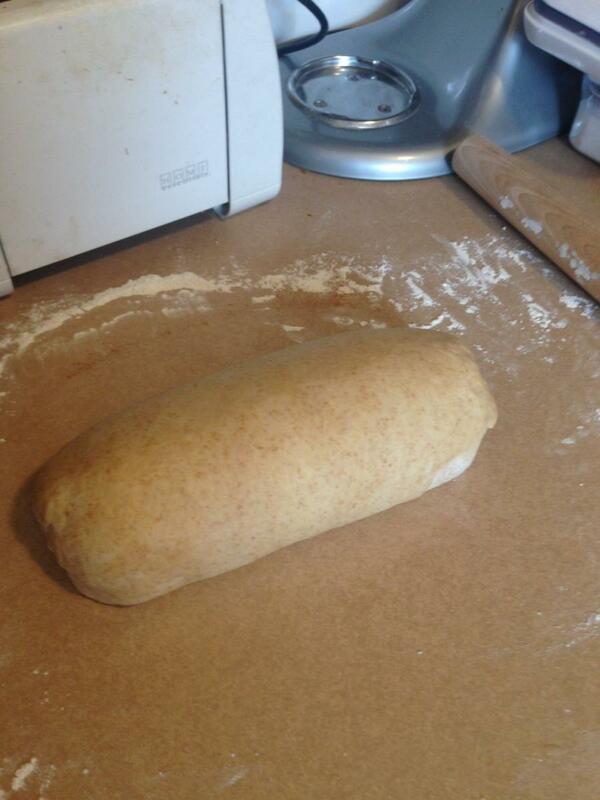 Once shaped, cover the loaves with a clean towel and set aside for a final rise, approximately 1 1/4 to 1 1/2 hours. Halfway though the final rise, begin preheating the oven to 450 degrees. If you are using a baking stone, preheat it as well. Right before placing it in the oven, score the loaves. Place them in the oven and use whatever technique you use to create stream in the oven (squirt bottle, skillet full of hot water, etc) to encourage proper crust development. After 20 minutes of baking, rotate the loaves 180 degrees so that they'll bake evenly. Bake until an instant read thermometer reads around 200 degrees, which took approximately 35 minutes for my batard ("football") shaped loaves. I still haven't bought a scale so having dry measurements is so helpful. Looking forward to baking this rustic bread this weekend. I too tried this recipe this past w/e. Used the 'no-knead' method. The bread turned out awesome. I used a high hydration percentage on my loaf. 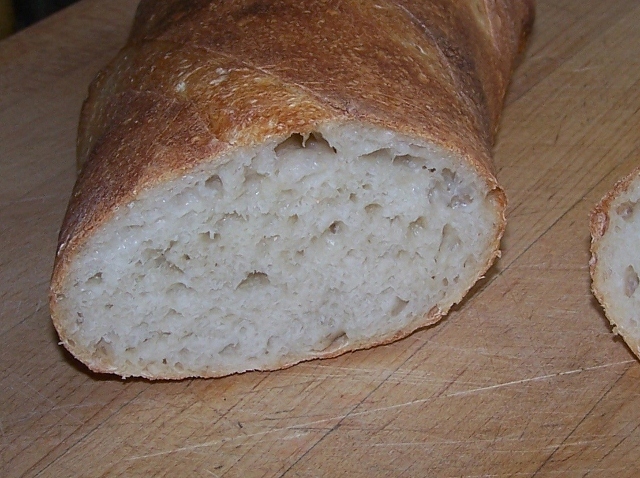 The crumb was similar to ciabatta. The oven spring was extraordinary. The flavor was excelllent. Looking forward to trying my Challah bread this w/e. Used the no-knead method on this one also. Then froze the loaves before shaping and final rise. I'll take two out of the freezer on Thursday. Put them in the refrigerator and shape, proof, and bake on Friday for Saturday's oneg. I always have difficulty mixing the dry and wet ingredients. I followed the recipe exactly but I keep getting a very sticky dough that I had to keep adding more flour and end up working with the dough for quite a long time. Has anyone attempted this beauty? It looks like a wonderful Holiday goodie. Any pointers before I dive in would be a help. You are talking about one of these? No, I haven't baked one. Maybe I'll try it this weekend. This rustic bread recipe has become one of my standards. I bake this almost every weekend, alternating with the pain sur poolish. Pretty similar except the pain sur poolish is white flour only. 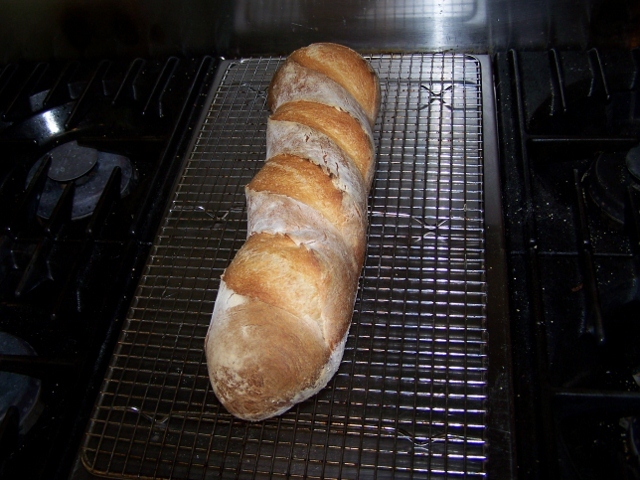 Amazing how difficult it is to make a really good French bread. or is couronne another bread-type and this question got misplaced in this forum topic? Google isnt even showing me any meaningful results... it's a crown in french...uh. Yes this looks more like Peter Reinhart's rendition.I recently saw this bread made by Steven Sullivan (Acme Bread Co.)on PBS Episode #110 of the Baking With Julia Series. It was a incredible demonstration. He made a chain made out of a thin log of dough placed in the bottom of the form. This then became like jewels on the top of the crownrather than creasing the top into 4 quadrants (BBAp75). Huh. 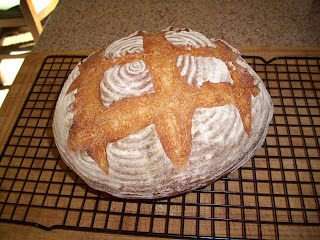 This weekend I tried using the rustic dough to make a Courrone in the way that Peter describes. It wasn't very pretty, but the bread was wonderful! I think I'll give it a try since I'm having much better crust and oven spring with the new Old Stone Oven baking deck. Floyd does the open hole in the center reduce baking time? Hmm... I'm trying to remember. I think it definitely took less time to bake than a large, football loaf, something closer to the amount of time it takes to bake baguettes. I didn't watch the clock closely (I just eyeballed it and did the tap on the bottom). I'd guess mine baked around 25 to 30 minutes at 450 or 460. 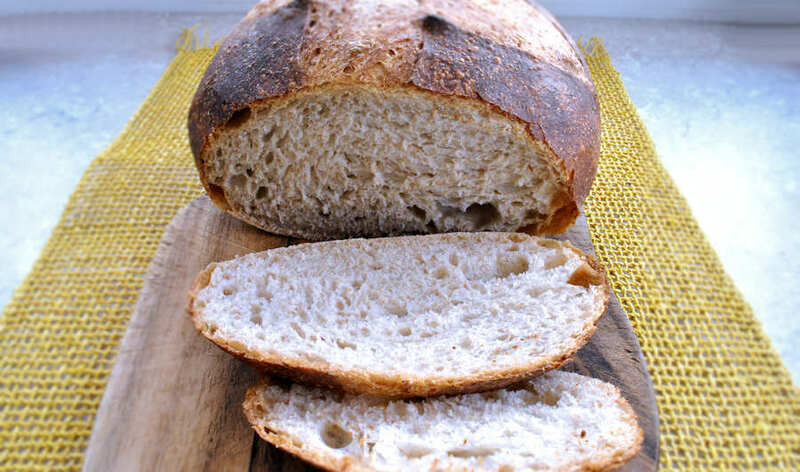 Try using about 70-75% water to flour and use the strongest bread flour you can find. I buy 25# bags of ConAgra bread flour at Costco, which works just fine, and I add about 5% coarse-ground whole wheat flour, which I think gives better flavor. I also use a wet pre-ferment that has approximately the same flour-water proportions, plus 1/2 tsp or so of active dry yeast (which I hydrate before adding). The key, I think, is to knead for a long time ... usually 10-12 minutes at low speed on my Kitchen Aid, then turn it out onto a heavily floured work surface. I also stretch and fold the dough 2-3 times over 2 hours or so, then form my loaves and put them onto individual pieces of oiled and semolina'ed parchment paper. I let them proof en couche and bake them on a stone using Reinhart's hearth-baking technique (preheat to 550F with steam pan, add steam over the next 2-3 minutes, then turn the oven down to 450 and bake for 20 minutes or so). I've also found that spritzing the loaves with water before I bake them gives me a much thicker, chewier crust. So far, I've had very good success with this method ... in fact, of all the breads I make, my wife likes this one best. Another thing that helps with the large holes is to be careful not to degass. In other words, don't knead after the first time. As it doubles, just fold it over lightly a couple of times and let rise, again. Don't press hard on the dough. What makes for good holes is wet dough and light handling. You mention Jeffrey Hamelman's book of techniques and recipes. Is it strong on techniques; does it have good photos showing the techniques? I'm a visual learner. I really emjoy this site. Keep up the good work. Hamelman's book has no photos. There are some decent line drawings that could help you a bit, but overall it is quite text heavy. There are a number of Jeffrey Hamelman videos on Youtube. Go there and search Hamelman and I you just might find what you're looking for. If not with Hamelman, there are any number of videos on aspects of bread making. Interesting - that is the first recipe I have seen with salt in the preferment. I take it that does not kill the yeast too early? No, it doesn't seem to kill the yeast. I think it is supposed to be more of a pate fermentee than a poolish, so it is more like a complete dough than a sponge. I'm glad someone also had a question about salt in the preferment. I'm relatively new to making artisan breads at home (just 3 months into it and totally obsessed). Everything I've read has cautioned against salt at this early stage, so it's really interesting to learn about your outstanding success. Something new to try! My first attempt at rustic bread turned out well despite a few deviations from the recipe (about a tablespoon extra water and a 16 hour ferment time before refrigeration overnight and forgetting to put salt in the final dough). I just have to salt each piece of bread before I eat it :-). Thank you for the wonderful, forgiving recipe. Does anybody have experience with this? I am trying to spend money that will make a difference, not just spend money; the pan is $20.00. I have also ordered a 60" by 36" piece of #10 cotton duck canvas for 11.00, including shipping, from www.ahh.biz to serve as a couche. Anyway, thanks for helping me bring the best bread I have ever baked into my house, shaped like a corkscrew and undersalted, but otherwise beautiful, delicious, and with a wonderful texture. I mentioned this before on my own blog, but it bares repeating. I purchased a two loaf pan at a kitchen outlet store in a Tanger outlet mall in Fort Myers, Florida. It is silvery, plated with some type of metal, and the surface is somewhat rough. I have used it 5 times and have had no major sticking problems. It cost $3.00. These types of generic kitchen stores can be found in Tanger and other outlet malls. I had actually thought about getting some of these to increase the ease of baking baguettes. The Hamelman book actually has a pretty nice series of photographs showing crust and crumb of baguettes made different ways. These make it look like the pan sort of confines the oven spring, reducing the size of the holes, and changing the shape of the slashes. Have you noticed anything along these lines? I have the two-loaf perforated Chicago Metallic french bread pan. It works well for me. I have read much advice the one should only bake rustic bread directly on the stone, and not in a pan, but it seems to work and it does provide the support for the wet dough that you are seeking. The bottom of the loaf stays golden rather than turning dark brown, but as much as I like dark crust I think that contrast is a good thing. I agree with Nancy - wet dough, light handling . It is amzaing how just folding increases the strength and elasticity of the dough. The old fashioned idea of "knock the hell out of it" is just so wrong!!! The dough for my 4th version of rustic bread is now fermenting. My first try was shaped the best, but I mismeasured salt and perhaps the water. The next 2 tries I measured very carefully, doublechecking, verifying. The dough was a batter, I literally had to pour it onto the baking tiles. So this time (some weeks later) I didn't immediately put all water for the final dough into the stand mixer bowl; I added it slowly during the mixing process. After mixing slowly while adding the water, I had a dough that barely came away from the mixer bowl, very sticky, with the splat-splat sound of sticky dough splashing against the mixer bowl just eliminated. There was 3 7-8 ounces (i.e. almost 4 ounces) of water held back. I will proceed with the fermentation, folding, proofing, shaping, etc, and post my results. After the April budget crunch in my household passes, I think I will also buy the Hamelman Techniques book, to see what he says about the texture of the dough after mixing. I loved the flavor of my 1 inch high bread that I poured onto the tiles, but I'd like it even better in the shape of a loaf :-). Well, I think the bread needed the extra water after all; the crumb had very tiny holes, and folding the dough was difficult. and saw a few details about the mixing and shaping that I didn't fully appreciate before. All in all, I like this bread a lot, and appreciate the suggestion by someone (Floyd?) to work a single recipe over and over and see the effects of varying the processes and ingredients. Thank you for the opportunity to learn and share here. ahhhhhh... and another thing... I totally miscalculated the time line of the bread... and I am bush wacked tonight and need to go to bed... I put the bread in the refer for the night after the 2.5hrs rise time and plan on letting the bread raise tomorrow night before baking... this gunna be ok?? Can I go from the refridgerator to the oven?? with this bread?? I often go from the fridge to the oven. No need to let the cold dough heat up. Just put it in the very hot oven, steam it and it bakes very nicely. I shared a recipe with a friend and she questions making bread w/o any sugar in the recipe to feed the yeast. It was the Rustic bread recipe. I've been making it w/o sugar but my wife added some sugar while making the recipe and hers did seem to raise higher than mine. Any opinions on adding sugar either way? Sugar is, for yeast as well as us, basically junk food. There are complex sugars (maltose) in wheat flour that yeast breaks down into simple sugars (glucose). If you add much table sugar to your bread, the yeast will stick to feeding on it, a simple sugar, rather than go do the hard work of breaking down the maltose. So you'll get fermentation, which releases gas and leads to a good rise, but you won't necessarily get the flavor you get as a result of break down of the maltose. So when are trying to make a bread like this, where the flavor really comes from the wheat, most bakers suggest adding minimal (or no) sugar. If you are baking a bread where the flavor comes from the other ingredients and you don't really want a wheaty, nutty flavor, like, say, a sweet bread, adding sugar or honey is fine. Thanks for the clarification. 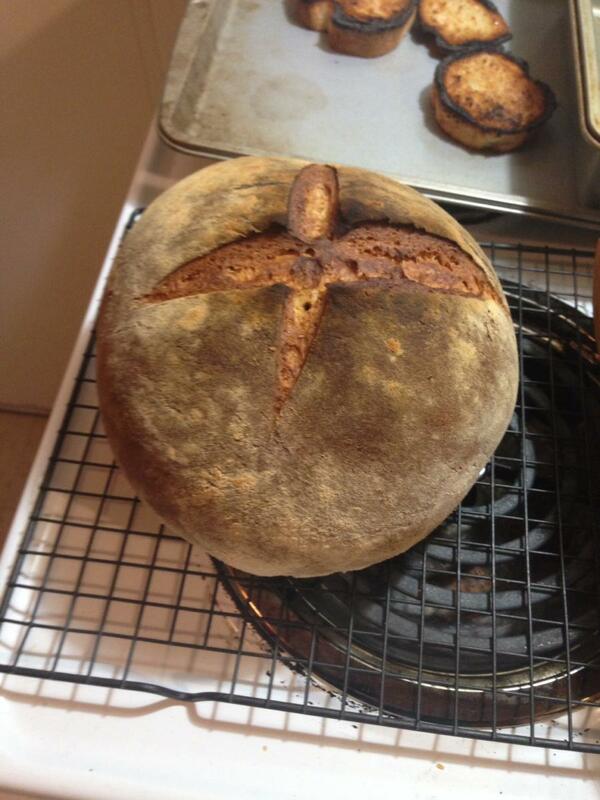 Now I can tell my wife that although her's had risen quite well, my bread had a more complex wheaty flavor! Still Trying to find a good loaf of bread in South Florida! I forgot to tell you thanks for posting such a great recipe. We haven't purchased any bread from over a month. We alternate between the Italian and Rustic recipes. I must admit that I use all white flour for the Rustic Bread. Panera's is just opening a store in the new Coconut Point mall in Fort Myers. I love their asiago bread. I once had a coupon for a free loaf of their Asiago Bread, and I loved the flavor. I've been meaning to try to duplicate it, but never got around to it. When they came out with a Panera cookbook, I thought, "Aha! Now I can get the recipe." Turns out the book only had recipes for using their bread, not to bake the breads themselves. I made a batch for a friend's post-Thanksgiving dinner party, and it was a smash hit. It calls for a poolish starter, which I let develop overnight instead of the 30 minutes the recipe calls for, and I think that helped. "I am not a cook. But I am sorta cooky." Cooky, thanks for the recipe! I began this loaf last night. I mixed the preferment and it didnt seem to have anough water as the dough wasnt completely mixed so I added about an extra 1/2 to 3/4 of a cup of water. The dough still seemed too stiff but I left it. This morning I came out and saw that the preferment had more than doubled in size and I was relieved. I mixed the final dough, and it didnt need all of the water or it would have been too slack. I kneeded it and left it for 45 mins. I then folded it and have timed it for an extra 45 mins. This is where I am up to now. I planed to fold it twice like the recipe says and decided that folding it at 45 min intervals in the beginning of the fermenting/rising period was a good idea so that it had the last hour untouched to rise. I am afraid that I;ll end up with a heavy bread. Is it just rising slowly becuase of the little amount of yeast in it? (until now I have been practicing my skils with lesson one and two, and felt confident enough to try something else) I'm due to fold it again in about half an hour. SO I will see how it goes. Is your house cold and/or was the water cold? That'll slow it down. Hamelman's times assume that after mixing the dough is around 76 degrees, which is much warmer than my house or dough right now. It should rise slowly but, given time, rise (assuming your yeast is good). Find a slightly warmer place for it perhaps, like the cool oven with just the light on. And/or give it an extra 45 minutes between folds. Doubling the rise time may seem drastic, but it really isn't on a cool day. lol. I am in Australia.....in midsummer! admittedly it has been a cool summer and my new place is cooler than most houses. I have it sitting on top of the oven and turn the oven on for 5 mins and then turn it off so that the kitchen is warmer. That's right... I forgot where you are located. If you know the yeast is good, then I say just sit back and give it time. It is disconcerting the first couple of times you bake a low-yeast bread because it does take so long, but the payoff is worth it. Sourdough is even more painful: even with an active starter, it isn't unusual for it to take a dough 3 or 4 hours to double in size. Just sit back and let it do its thing. I received the large, bell shaped Le Clouch for Xmas, and I decided to use this recipe for a comparitive test. I used the quantities listed above, but mixed all at one time to use the Kneadless method. The only change that I made was to use 1/2 tsp yeast. After mixing, the dough sat at RT for 18 hours. At that time, I roughly divided it into two halves. The first half, I envelope folded, let sit for 30 minutes, and formed it into a ball. The instructions that come with the clouch say to put the ball into the bottom of the clouch, cover with the cold bell, and let rise till doubled. Then put it in a 450 oven for 15 min., then reduce to 400 for another 15 min., remove the cover and bake for another 10 min. or so. I followed these instructions exactly, except after 1 hr. rising, it was only about 1 1/2 original size, but because it was spreading out, I put it in the oven at this point. The results seemed excellent. I got a golden loaf more than 2 times the size of the original ball. Coming out of the oven, it had a thin, crispy crust, but unfortunately, after it cooled, all of the crust became soft, except for the bottom, which had been on the stone bottom. 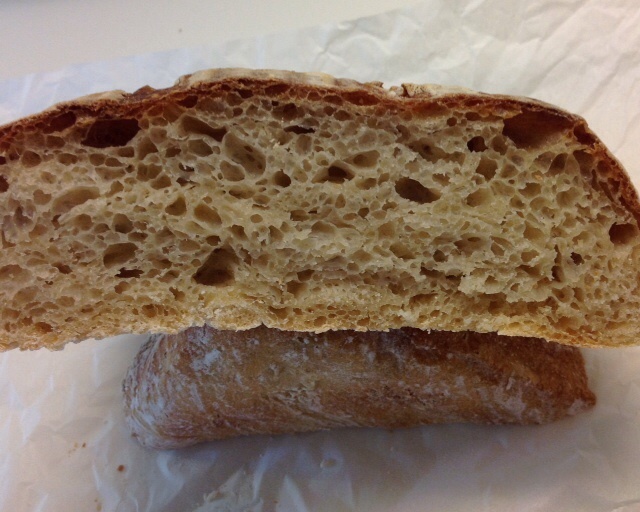 The crumb was very nice, with some medium sized (1/4-3/8") large holes, and the taste was excellent. The second batch had to be refrigerated for 5 hours or so, and after a 1 hour warmup, was prepared like the first one, but it was risen in a linen lined basket. My normal, flat stone and the top of the clouch were put in the 500 oven for 1 hour. Once again, I didn't get a lot of rise in the basket. 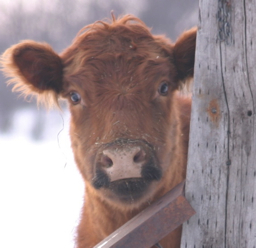 I removed the hot bell, spread some corn meal on the stone, plopped the ball on it, and covered with the bell. After 20 minutes the temp was reduced to 450, and 10 minutes later I removed the bell. 10 minutes later, the inside was 205 and I pulled it from the oven. 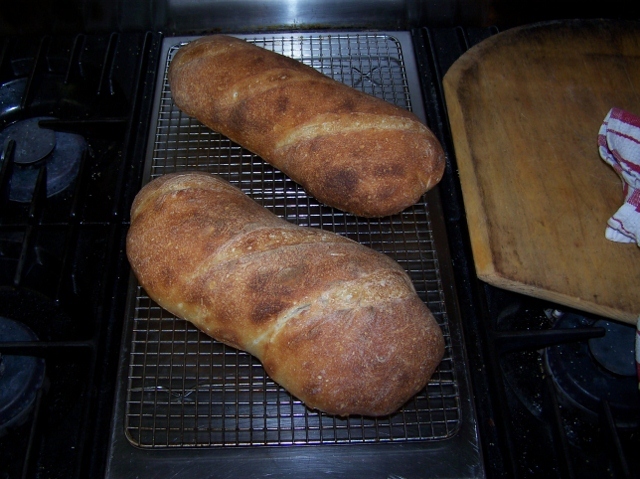 The loaf was 3-4 times its original size, had a hard, crispy crust, and many more of the 1/4-3/8" holes. After 10 hours, the crust is still crispy. The taste of the two loaves seem equivalent to my 69 year old palate. Using this bell is much easier than using a pot and lid, IMHO. I got some unexpected results since posting the previous comments. After baking one loaf in a hot clouch and the other in a cold clouch, I sliced them up and froze them for use as my morning toast. 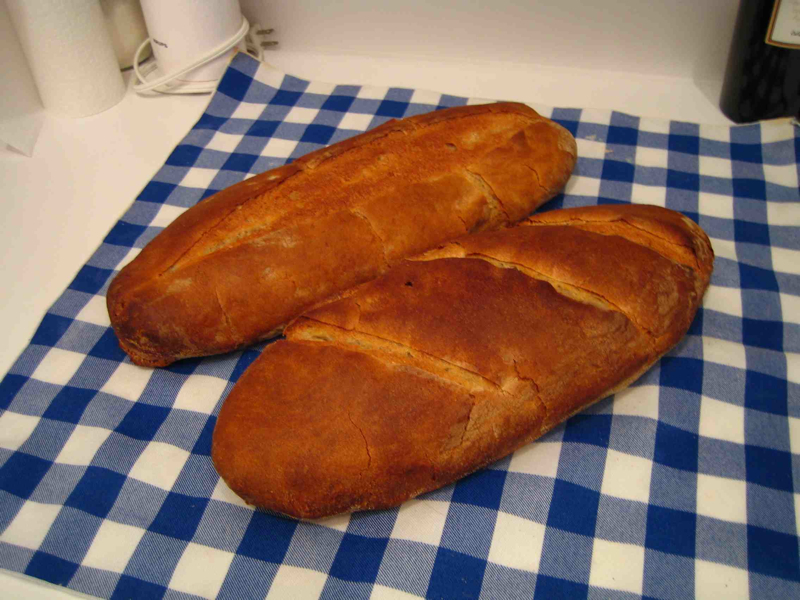 The bread from the hot clouch becomes dry and crisp, with a thick crust. The bread from the cold clouch comes out of the toaster with a delightful thin, crisp crust, but the crumb comes out soft and chewy even when toasted fairly dark, just the way I like it. Yesterday I made this batch into 4 small loaves. I had to go shopping and left the dough to rise. I took longer than I expected, so 3 hours later I came home to find my dough spreading all over the place! Over the sides of the baking tray I had it on! I quickly folded it up and left it to rise again. 20 mins later it was pretty big again, si I folded it again and left it for another 20-30mins. I cut it into 4 and let them rest then chaped them. it was like the beasties were having a frenzy. They rose so well! I then slashed them........and they were good slashes! Nice and deep, Once they were put in the oven, I got a huge oven rise out of them. I dont normally get an oven rise. 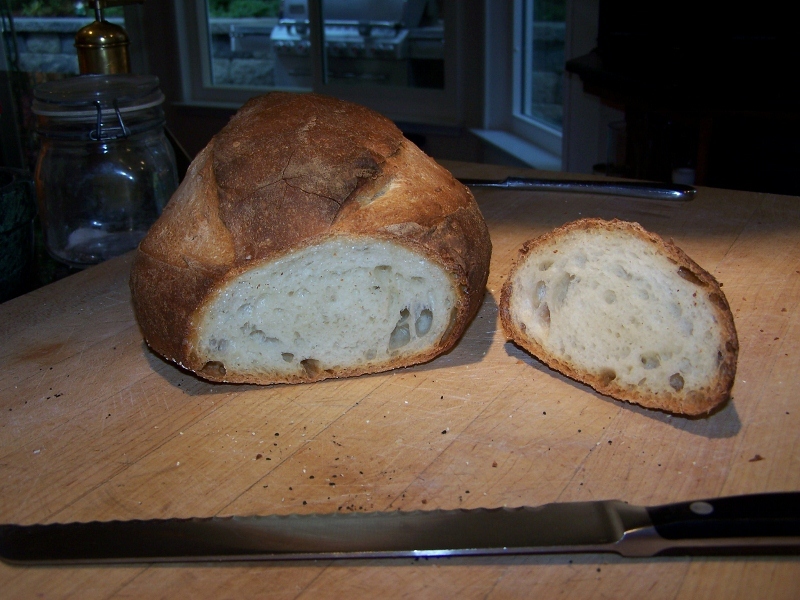 I used this rustic loaf as a base for some jalapeno cheese bred today. It came out great! Que bueno! Rustic bread is one of my favorites; you've improved on a very good thing, and I'll be borrowing your idea one of these times. 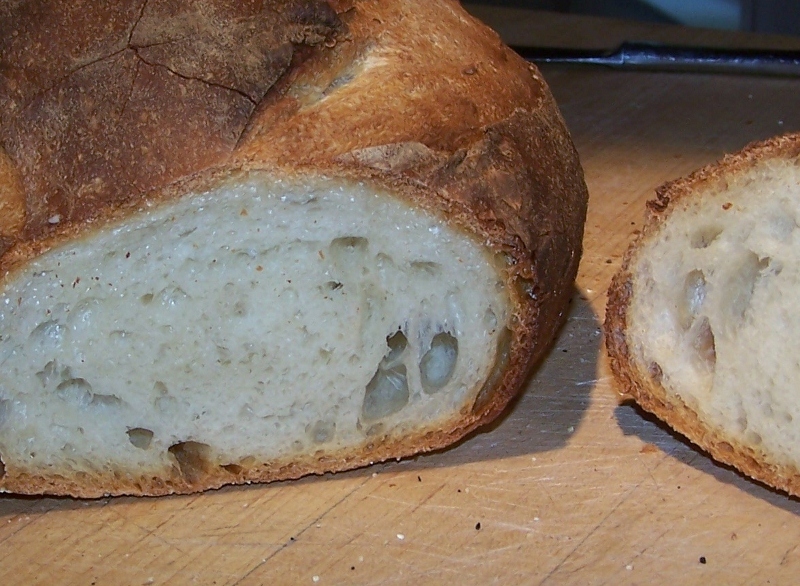 The crumb was fairly dense, nothing like the open crumb a rustic bread should have. The dough was too slack to shape, so the final loaf looked like an oblong pancake. I used King Arthur AP flour and Bob's Red Mill Whole Wheat. I followed the recipe as given, except that I allowed about an hour extra rise time because the gluten didn't seem to be developing much at all. Any suggestions as to what may have gone wrong? I make this all the time and I love it. the only thing I can suggest is mabe the wholewheat flour needed a little help with the gluten? I find I cant make wholewheat bread with out some gluten added or else it flops and is dense. Tis may be it, but it may not be it at all. sorry, its a suggestion though. have I confused you enough? You need the Laurel's Kitchen Bread Book. It's all whole grain and no added gluten. Her secret is plenty of kneading to develop the gluten. I made her Buttermilk Bread yesterday kneading briefly in my Kitchenaid; then I switched to Stretch & Fold, with 4-5 of those. It's fabulous! I didn't try adding gluten, since neither floydm nor Hamelman made any mention of it. How much of the stuff do you add when making this bread? You can try what rosalie said or I add 1-2 tablespoons gluten flour per cup of flour. I also have been doing half whole wheat and half white unbleached....but now I am doing 100 percent whole wheat but sifting half. Its quite nice. Tried the Rustic Bread recipe this weekend. I scaled it down to one loaf. It works pretty much as described. Mixing preferment into dough is quite a bit of work, so is first folding - the dough is much to soft and sticky at this point. Second folding is much easier. I messed up a bit with oven temperature - I should've remembered to turn it down a notch, so the top is a bit too dark for my taste. The bread turned out quite nice, although I'd put more salt next time. Also, you absolutely need a good bread knife for this one. Well, isn't that a loverly loaf? I followed the formula just as is, using rye flour instead of whole wheat. For the steam I tried a method I saw on a video on this site: throw in a cup of hot water and shut the oven door quickly to trap it. A few minutes later I threw in another 1/4 cup of water, though not sure if that had any effect. As others have experienced, the dough was very sticky and damp the after mixing the pre-ferment in. I decided that using a spatula rather than my hands is better for transferring the dough from vessel to vessel. Love love love the results! I have had the same thing happen when the dough expands during proofing or spreads out so 2 loaves get to close. I use corn meal under the dough and if proofing 2 loaves, place the dough towards the outside edge and pull a ridge up between the two loaves so they can not touch as they expand. Liberal corn meal will help. Then when it's time to bake pull the edges out so the paper is flat and you have a couple inches of gap between the dough. It's like a paper clouch. When I'm proofing batards I'll roll up a small kitchen towel and place it on the outside to support the outside of the loaf. This eliminates the need to handle the dough just before it goes into the oven, which is a help with high hydration dough. I don't think there is a top side that matters with parchment. I usually place the cut sheets curl side down, so it stays flat but I don't think it matters. I don't usually proof on parchment, but rather flip my dough out of brotforms onto parchment to bake. When I have proofed on the paper I did as Eric does and sprinkle cornmeal on it first, so give that a try. If there's a right or wrong side..you couldn't prove it by me!! The bread colour, slashing pattern and shape blends wonderfully with the wood grain background. Poster worthy. Any chance to see the crumb? Wow that's a nice way to start off. Very nice job and I'll bet they taste great. 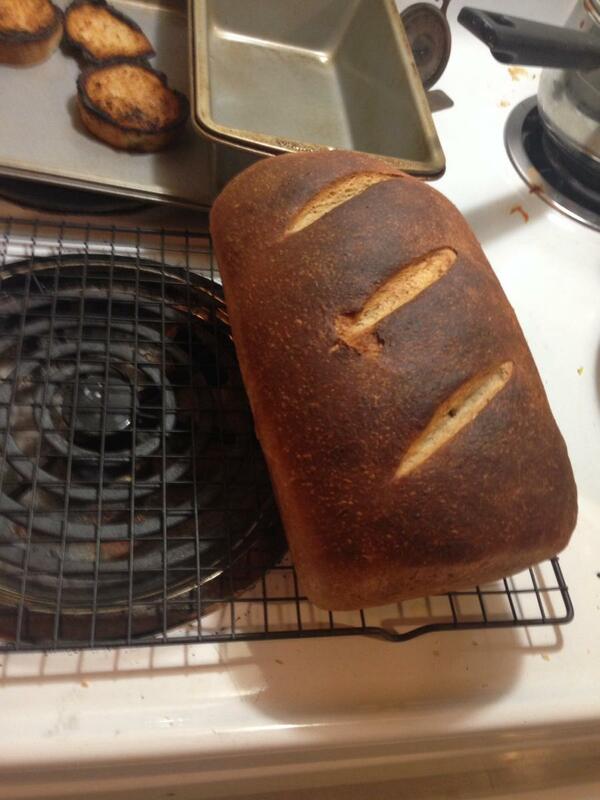 I think you could do without the whole wheat flour, although it gives the bread a much better taste. I would be interested in seeing how your bread turned out. Thanks for the wonderful web site, I'm trying to expand my breadmaking these days beyond "Grandma Vita's" bread and pizza dough. I really like this bread, having just eaten one of the two loaves hot and out of the oven. The crust is delicious. However, I feel that for the effort there should have been more flavor. I kind of wanted it to taste better than the old Italian bakery where I usually get my "one pound loaf". It did actually seem to get better tasting as it cooled, though. Even my gf said it was kind of bland, and she usually raves about my cooking. I wonder if I could use more salt in the dough? I used regular iodized salt, except my salt mojo has been way off the last few months, I started using sea salt in other cooking and just can't seem to salt anything right. Also, I used AP flour, not bread flour. I otherwise followed the recipe, the ferments went fine etc. It worked! I did have to turn my loaves over and cook for five more minutes on full heat with the tops facing downward to properly crisp the crust because there's something wrong with my oven (everything- cakes, bread, potatoes- cooked on the middle rack burns before the top is browned...) but this bread is magnificent. Oh, and I had to do a second remedial rise because the first time I got stuck at an appointment. They still worked. Is German 1050 flour bread flour? Thanks so much to all here for the fab tips. I'm buying Hamelman's book. Tried this one out this Thanksgiving weekend, and while time consuming was well worth the result. It tasted terrific, looked good, had a wonderful crumb, and makes and excellent base for french toast. Thanks for all your great information. What an amazing assortment of photos! 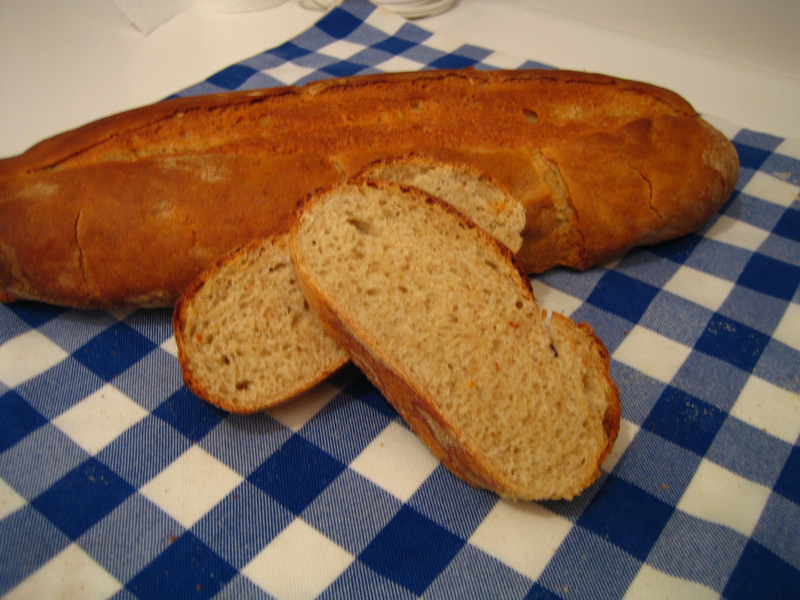 Rustic bread is truly divine! 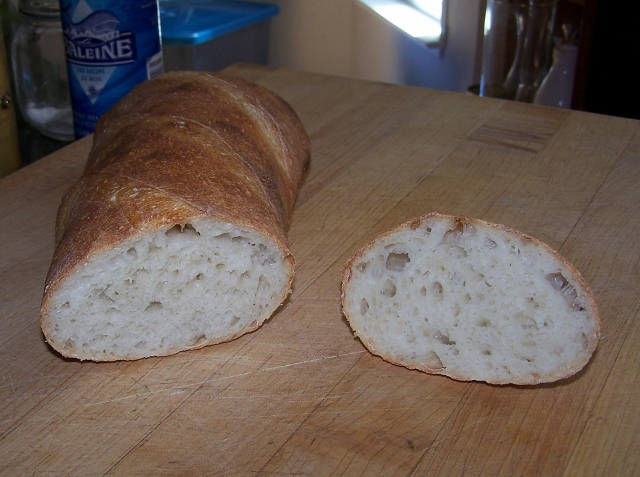 I have finished poolish Ciabatta today and it turned out great! I realized that it's all in the handling and not letting out the gas to keep those big air pockets. Nothing can beat that satisfaction of making your own and the smells that come out of that oven. And a great website. I found this recipe yesterday, so I thought I would give it a try. The dough was a little wet and needed another half cup of flour but the results appear good, so far! I pulled this 20 minutes ago. Just pulled from the oven. The dough sat in the fridge for two days. I let it come to temperature and do a final rise after I formed the loaf. I have a long ways to go when it comes to forming a long loaf properly. More oven spring than I expected. But this is the perfect recipe for what I'm trying to accomplish. I did the preferment yesterday using a piece of leftover dough from the last batch instead of yeast. I used almost no yeast when I combined it with the rest of the ingredients today. I measured instead of weighing and the dough is actually a little tighter. I didn't add any more flour than the recipe calls for this time either. I'm not baking until tomorrow, so I'm doing the first rise today and then I'll throw it in the fridge overnight. I'll form, proof and bake them tomorrow. I'm also using just white flour until I get the results I'm looking for. Just pulled two from the oven. Very different than the first batch. I pulled the dough out of the fridge and let it warm up a bit before I formed and proofed the loaves and placed them on parchment. They looked like ciabatta loaves going in but sprung up nicely. The crust is ligher but crisp with a light mouth chew. The crumb is almost exactly what I'm looking for with a nice custard feel in the mouth and good flavor. They just came out kind of ugly. As for the actual baking, I heated the oven to 550 and then dropped it to 450 when I put the loaves in. They were misted with water as was the inside of the oven, instead of the 1/2 cup of water in the hot pan, like I usually do. 20 minutes total was enough but I'd probably go a couple of minutes longer the next time around. As with pizza, parchment proved it's worth. Both loaves were on the same sheet and ten minutes into the cooking process, I just pulled it out. No muss, no fuss. I saw your recipe for Honey Wheat Bread and you soak the wheat flour for an hour or so. What are your thoughts of doing that for this recipe? This one isn't as wheaty, I don't think, so I personally didn't think it was necessary, but it wouldn't hurt anything to try it. Here is a picture of a loaf of Rustic Bread I baked today. I had to play with my new toys - a 9" round brotform, new lame, and bread peel. Thanks to everyone on this site for all the great information - it really helped me get used to new(for me) techniques - French fold, stretch and fold, shaping and scoring. I usually made whole wheat bread in loaf pans - this is a new and different experience. I'll post some 'crumb shots' once the bread is cool enough to cut. What kind did you buy? Are you happy with it? I bought a wooden baker's peel at Bed, Bath and Beyond! It was pretty inexpensive and works fine putting loaves in the oven. Usually, I take the loaves out of the oven with oven mitts. I have been reading this site for a week, was looking for tips on my futile attempts at creating a sourdough starter. So I ran across this recipe and thought I'd try it. I'd never heard of a preferment before and it was an attractive idea! So last night, I mixed it up. I only have a gram scale so I had to convert lbs and oz to grams, no problem since I'm a wiz at Excel! Anyway it looked pretty stiff last night, but this morning...oh my! It was almost overflowing the bowl! So then I waited until 15 hours after I mixed it, and continued on with the recipe. It rained yesterday so the climate here is moist and apparently that lead to an extremely sticky loose dough! I was frightened but figured it was either add a bit of flour or have a pancake for a loaf. I was very careful to only add enough flour so I could roll the dough out with a spatula in one piece. I followed the fold and rise instructions to the letter. My baking stone is only big enough for one loaf so I also put a cookie sheet in the oven, set up a pie pan for the ice cubes. I have been making bread for 20 years or so, but never attempted any type of artesyn bread so shaping the loaves into a batard was a challenge but fun! I let them rise, heated my oven to 450. I scored the loaves, which was insane with that high of a hydration, but my kitchen knife is extremely sharp and worked like a charm! I popped the loaves in the oven, used a squirt bottle and popped some ice cubes in a pan in the bottom of the oven, set the timer for 35 mins and couldn't wait to see the results! Who knew that bread making would make my husband so romantic! So 45 minutes later, this is what I got out of the oven! They're a littled dark but I can't wait to cut one open and try it, they smell fantastic! Thank you Floyd for sharing this recipe! Thank you! The crumb isn't quite as airy as I'd hoped so I won't post a pic of it until I get it perfect! But the kids and hubby said, " wow mmmmmm yummy nom nom nom!" It really tasted like bread I'd pay good money for at a bakery. It was fabulous! And nearly gone now, guess I'll be making more next weekend...woo hoo. Doesn't look too dark to me. Doesn't look too dark to me. You should shoot for this robust a bake for this style of bread. Let me know if it wasn't awesome. Makes me hungry just looking at it! Good work. Here's my creole onion soup, and yes the bread made a difference! I made this bread for Christmas day (without rye flour) and it turned out great. Best bread I ever made. I made it again today with 40% spelt flour in both the preferment and the final dough. It is spectacular. Nice and chewy with a great crust and very nice flavor. My wife and son raved about it. Hope to post a picture soon. I started to make this bread last week, had everything mixed & ready to go but had to leave for 5 days. So, I put the dough in a food save plastic container in the fridge. When I came back home let the dough come to room temperature and shaped, baked and ate. It was delicous but different. Two questions: 1-the dough had a fairly strong aroma the only thought that came to mind was beery, yeasty, alcohol smell. 2- when baked the bread was very good and had a slight "sour" taste. I've never made sour dough bread but this is what came to mind. Was this a type of "accidental" sour dough? 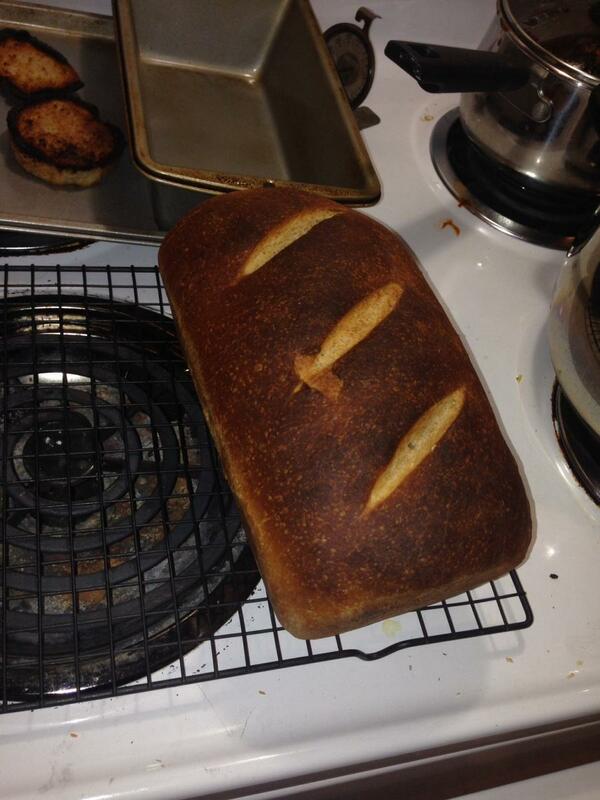 I made this bread a couple weeks back, but it came out rather salty.. While I thought it could do for a night of drinking! I liked that, salty bread begets more beer. This is my first time making this Rustic Bread Recipe. I just mixed up my preferment, having never using a preferment before, I don't know how this should look. 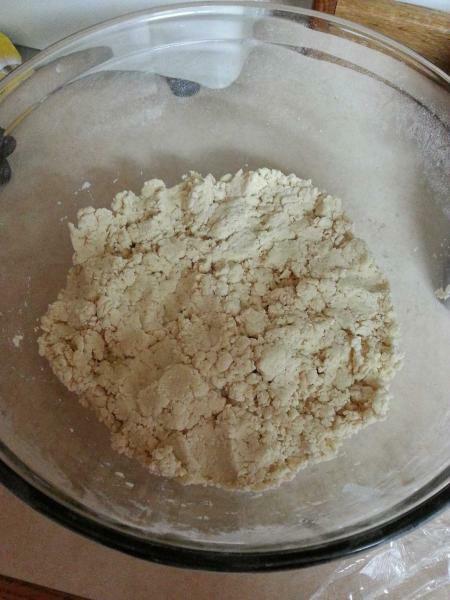 All the flour and water was weighed, and when I mixed it, had to add another 1/4c water to get the flour dampened. My dough is kind of like a moist gravel texture, and not a cohesive dough at all. Is this how this should be? Thanks Floyd you got me workin on upgrading my rustic bread. Last evening my goal was to get a better crust so I went 500 degrees in the kitchen oven with a water pan. Got a good crust this time but my sourdough needs improvement in other areas. I add 3 T sugar to the dough but after reading the posts here I see I don't need it. Next time I make dough no sugar and a little less hydration then we will see what happens. I feel I'm on the right path with bread -made my own starters, now have 3 different starters in the frig- thanks to your recipe and advice from all above. Will report next time with pictures. Upward and Onward! the dough itself after the final mix was pretty wet dough. Instead of doing the old school of kneading it when combining the wet n dry, I strictly used the stretch n fold method. Hope u cud enlighten me here as what did I do wrong here. I want to bake this again n again. Tqs For yr time. I made this bread per the instructions. Didn't have a brotform or a couche, just let it do its thing on a cookie sheet with a dusting of flour. The crust and crumb were fantastic, but the taste was meh. Did I do something wrong, or is this recipe generally not super flavorful? Is there a similar recipe (process, time) out there that yields more flavor? I get this question occasionally, about this recipe and a some other, and... well, it puzzles me a bit. What sort of flavour are you looking for? I've always enjoyed this bread, but it is what it is: a simple French bread with a small amount of whole grains to give it a bit more depth. In general, it is difficult to produce as strong a flavour with a yeasted dough as a sourdough, and a loaf with only about 25% whole grains is going to have a less pronounced earthy flavour than something containing more whole grains. Longer, slower fermentation will tease more out of your ingredients, and using high quality ingredients and unbleached flour help too. 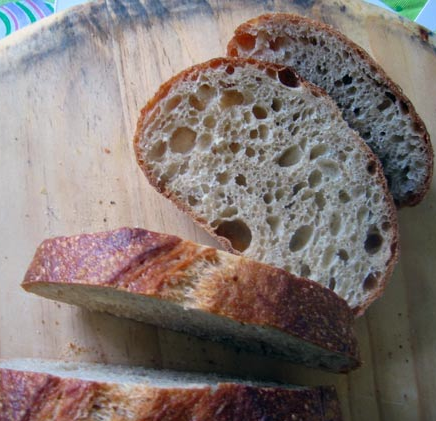 I guess one thought is if you know of a bread with a flavour profile you'd like to reproduce, find out a little bit about it -- Is it leavened with sourdough or conventionally? Made with whole grain flour or white flour? Does it contain cracked grains or other ingredients that impact the flavour? -- and then pursue that. You might find out an entirely different approach or set of ingredients is required to get what you were looking for. Is that at all helpful? Your slice there looks great, by the way. It'll be hard for me to describe the flavor. Let's see. My holy grail of flavor is Bay Cities' (Santa Monica) Italian loaf. Someone else asked about the recipe on this thread. MRosen814 in the thread actually asked the manager, who revealed that it isn't a sourdough, just a long fermentation. What is "long?" Wouldn't Hamelman's overnight (and then some) pate fermentée qualify as long? The Bay Cities bread is very yeasty tasting, almost sweet. I can't describe it. The crust is chewy and the crumb is open. The dough might be wetter than the Hamelman rustic bread recipe. This picture gives a decent profile of the build of the bread. Perhaps it's what Yvonne describes in the Bay Cities thread as a filone. Regardless of the taste, I'm glad you give a thumbs up to my bread! I'm slowly entering the realm of boules, batons, and baguettes, so it's reassuring to know my handfeel for the dough is getting better. The blisters on the crust suggest to me that they shape their rolls and then retard (refrigerate) them for quite a while, probably overnight. Never having tasted them though I couldn't say what else is different about them. A touch of malt is one possibility, or whey, like in this Italian Roll recipe. Made my first rustic bread of 2014. The loaf looked way better than the versions I tried twice in late (2013, a few posts above). Followed the instructions exactly as written above. Formed it in a banneton, which created beautiful striations. Used rye and bread-flour mix. Question for all: Is it usually this flat? (See last photo.) Overall I'm happy with the shape, but I want to know if my rise is not happening as expected. Not sure how it tastes yet, but will let you know. Waiting for husband to come home before we slice through this nugget. Nice looking loaves everyone! This looks like a must try. I thought for some reason the original post had temps and all the instructions or I would have included that. After mixing the DDT is 75 F.
Bulk fermentation should be 2.5 hours at that temp. 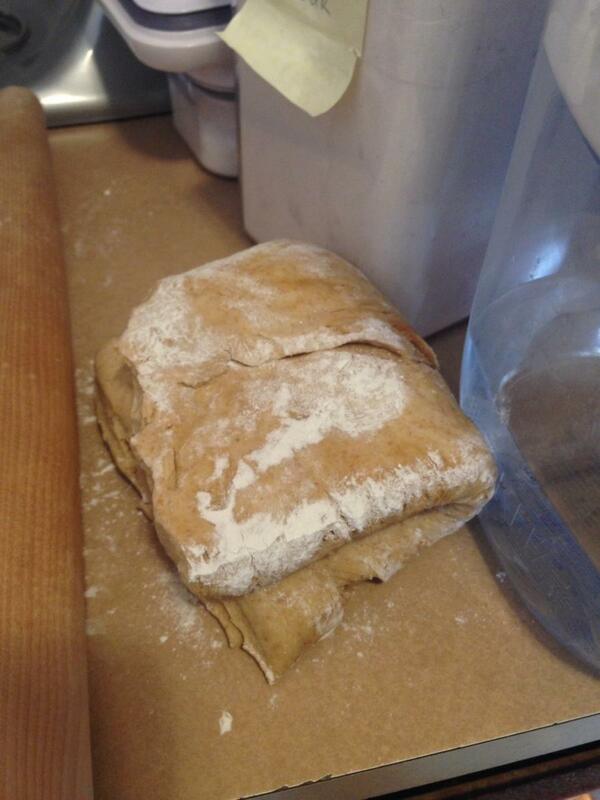 Hamelman folds the dough twice at 50 minute intervals. Preshape to loose rounds and bench rest 10-20 minutes before final shaping. Final fermentation should be 1.25 to 1.5 hours at 75 F.
Presteam oven, load bread, steam again. Bake at 450 F 35-38 minutes for the 1.5 lb/0.68 kg loaves. For the gram measurements, easiest thing would be to plug the numbers into a spreadsheet. LibreOffice is an excellent free open source program if you need one. 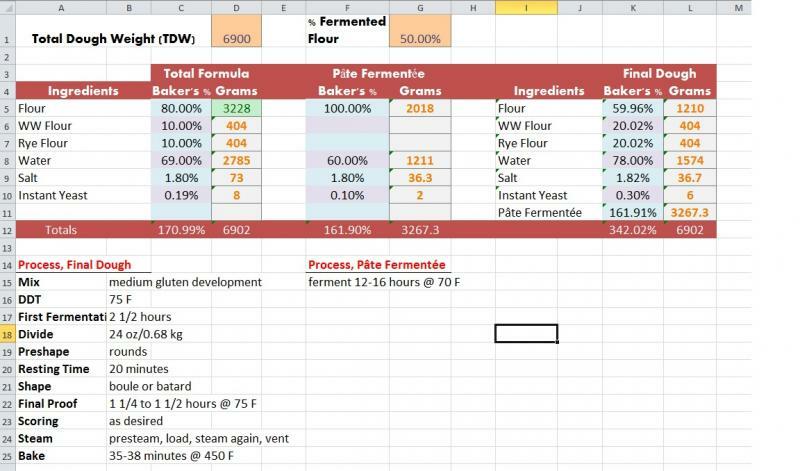 I'm not a professional baker or anything, but I based what I do on the Bread Baker's Guild of America formula guidelines, but lazier because it just needs to be good enough for me at home (and I don't know excel very well). So this is an example of how I would put in a formula for 10 units of 0.68 kg bread. In this case, I figure out what my total dough weight is, 0.68 kg * 10 = 6.8 kg or 6800 grams. I bumped it to 6900 to account for some loss during the process. I have no idea if that's enough when baking in large quantities though. I also have it automatically rounding the numbers which is why it comes out 2 g more than the TDW entered. *edit, put wrong recipe in on original image. 1. 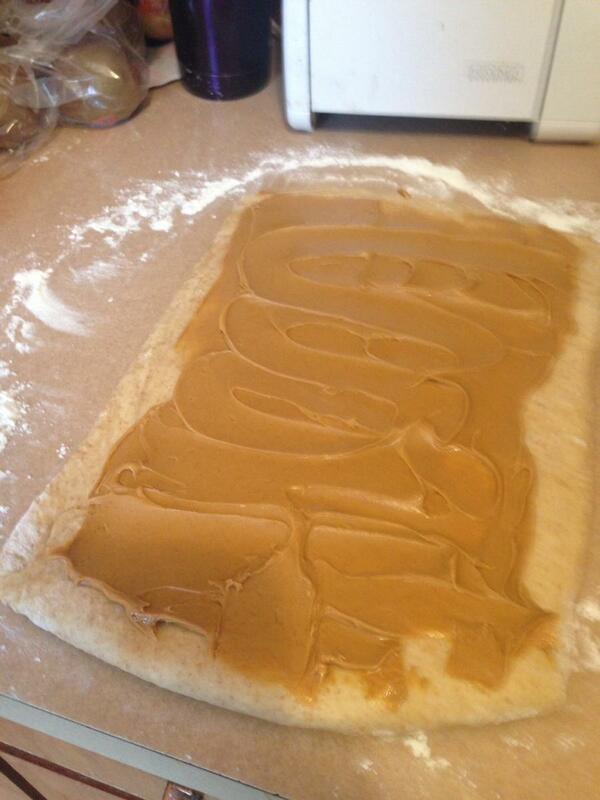 Following the formula, the dough was VERY wet, sticky. I could not shape it well. . Would not hold boule shape before baking. Flattened out before baking. Did not flatten out more once in the oven. 2. Never achieved the beautiful dark crust in picture. Only reached golden brown when done. I shall bake this bread tomorrow, looking forward to it. Can this be baked in a Dutch Oven? I love the look of it so much. I wonder if we could substitute the yeast for Sourdough or just add a bit of Sourdough as flavour enhancement alongside the yeast. I shall do that after I tried it first with your original recipe. This Bread is a Winner! I've got to admit that I've taken Floyd's contribution here, scaled it down a bit after converting the weight to grams, and shamelessly exploited it for all it's worth. 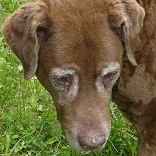 The next time I'm in Norwich, VT, I'll look for Mr Hamelman and tip my hat to him as well. My metric version of the formula won First Prize in the ethnic breads class at the Leavenworth County Fair on Monday and was part of my handouts for the class I taught today. That experience is described in my blog post from 1 August. If you haven't baked this bread yet, you've got to try it at least once. If you have baked it once, you've probably baked it again. Pass it on to another baker. Care to provide your metric measurements that produced the winning bread? This is the conversion to metric that I figured out on paper. I never bothered to learn how to use a spread sheet effectively so these numbers aren't precise but the formula does work. I scaled the ingredients down to 80% for my fair entry and still had success so I'm confident that the numbers can work for other bakers.All you have to do is follow the link to my blog. If you go back a few posts, you'll find a conversion that's much more complete by ericreed, getting into the bakers math aspect, desired dough temperature, and a few other points. It's a really good. 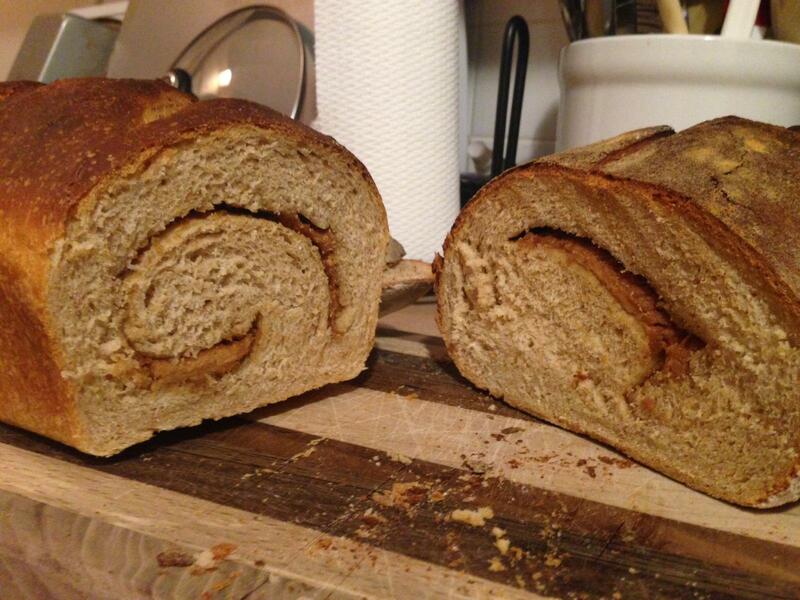 While I was rereading my blog, I found that I had listed the ingredients for the County Fair loaf in a recent post. This is the cut and paste list. I hope that this is easier for people to replicate. The loaf turns out to be of practical size for a small family or even a married couple such as Mrs PG and I.
I know that this post is over a year old but I just used this recipe to make the best loaf I have ever made. I registered just to be able to comment on it. The taste is incredible! I didn't quite follow the baking method though. 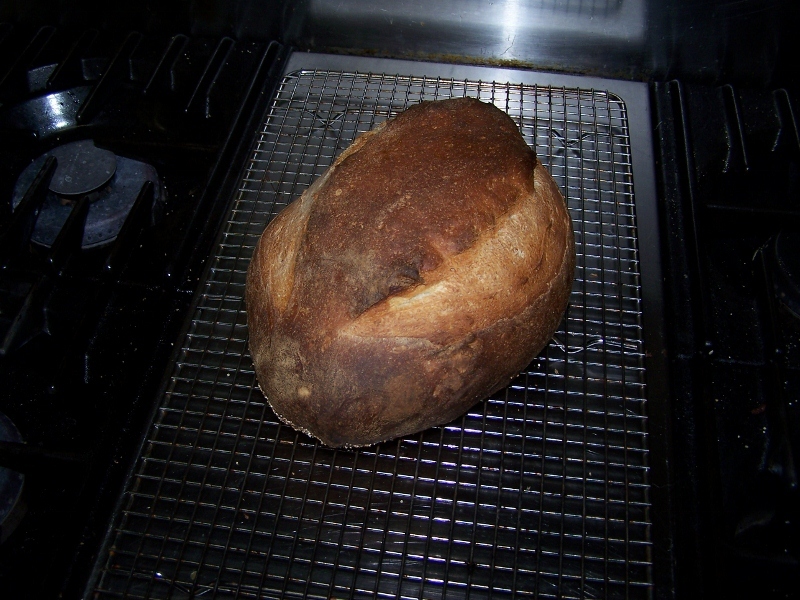 I baked it in a dutch oven and threw a quarter cup of water on top of the loaf just before putting the lid on. I baked it for 30 minutes with the lid on and then another 15 with the lid off. This is one recipe I am sure to make again! Can I use a Dutch Oven to bake these beautiful loafs? Yes, I would definitely think so. Sorry for the late reply, I shall bake this bread the day after tomorrow, looking forward to it. I have used this as my go-to loaf the last few months and am trying something tonight. i added a cup of peanut butter and will see how it goes. I love the taste of peanut butter, especially when part of the wheat bread and the smell of peanut butter bread baking is heavenly. I am hoping this dough is a good base for these experiments. In fact, if I am bold tomorrow, I might try to dust the top with cayenne to get a little heat on the crust. I didnt want to mix it in because it seems to hurt the yeast. i will post my loaf when I am done. I could have used more cayenne and doubled the amount of peanut butter. Made this recipe today and it was a hit. One comment that I heard was, "this bread is to die for." Making the bread my one thought was, that is a lot of salt. But the bread was very good. I will make it again. Actually at 1.8% the salt is on the low side of normal. Salt is usually between 1.8 and 2.2% (although I think in the UK several people are now using 1.5%). Glad the bread turned out well. Salt should be 2% of total flour but as with everything else in baking you'll find many opinions. Salt is a dough conditioner and controls the yeast. You don't want too much (a little goes a long way) as that will inhibit the yeast but you will still get good results with slightly less. I have been using a quick (5 Hour rise) rustic bread recipe and have been looking for a traditional one. I can hardly wait to try this one. I'm new to this forum and am already learning so much about bread making. I can see more bread adventures in my future. 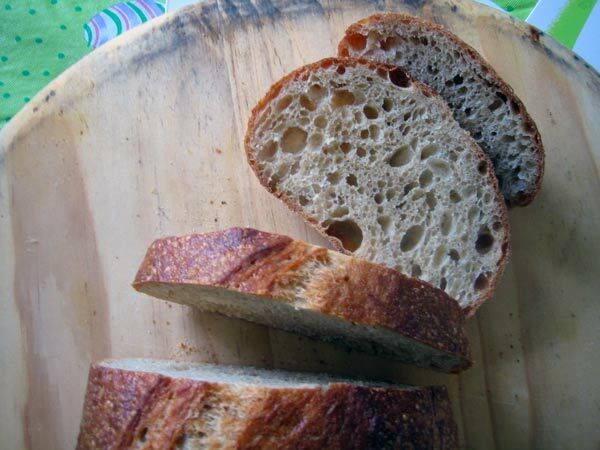 This is a great recipe, tastes better than my cheat's sourdough - thank you! It was quite tricky though using fresh yeast in such miniscule quantities, especially that I scaled down to half, for one loaf. I added 1-2g to the preferment and 2-3g to the main dough. Floyd - I just noticed today that the formula you posted at the top of this thread differs slightly from what is in my 2004 copy of Hamelman. I presume that is because you posted what you did rather than what is in the book, but I thought I would ask. It has been some time but, yes, I'm certain I did not post Hamelman's recipe verbatim. I simplify and cut corners in places where I don't discern a significant difference. 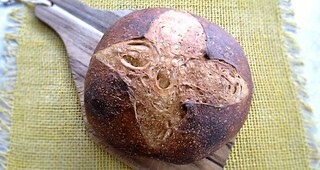 My experience with Hamelman is that he has polished and tweaked his formulas to the point of perfection for his bakery. I found a case where I discovered something and when I went back to check on what he had done, discovered that he had made a very fine adjustment that was not even noted in the text (a case where a more sour loaf needs more salt to balance the flavor profile). And that is what it takes to produce award winning product. But I understand your point. Thanks for the clarification. I don't disagree for a moment and would never compare my baking expertise to Hamelman's. He is a master craftsman who has baked these recipes hundreds, if not thousands, of times. I just want to share something tasty my family and friends enjoy. If cutting a corner here or there makes baking it simple enough that I'll (or others) will bake it often, that is far better than something complex that gets baked once (or not at all). thanks for the post of this fantastic bread, I will save the recipe and most cerently make one this weekend! made the bread this weekend and they looked great after the final rise bit when I tried to transfer them to the baking stone one caved a lot and the other a little. One looked like I punched it down and the other not so bad. I just baked them because my stone was hot and they were on there. The flavor was good but it definitely was denser than they should have been. I kept them wet so they could rise (they did) in the oven but pre bake they looked beautifu. Until I can figure it out I'll just let them rise on a baking sheet. to me like it may have been over proofed. I'm not sure, I followed the proofing times and even went a little fast with the last one. Maybe during the "fold" portion I didnt degass the dough enough. When shaping it into a ball before the football shape are you supposed to be degassing it? I think I just shaped it waited the 5-10 minutes then shaped it again. 1. Recipe says " add water and mix until flour is fully hydrated ". Does this mean that I keep adding water while mixing only until fully absorbed by the flour? 2. Any missing info, or possible pitfalls that i should be aware of? 3. Recipe makes two boules. OK to swap for a batard shape? Any change to recipe if I do this this? Looking forward to the end result. I'll let you know how it goes. I made some pretty big mistakes (I initially had the dough a little too wet and like a dope, I formed the loaves on the kitchen counter and had to transfer them to a baking sheet after the final rise). I was sure they would be a total loss. As it turns out though, they were among the best loaves I've ever made. I'd give more details about my experience, but there are plenty of good comments here. Thanks for the post Floydm!